Higashi-Azabu Amamoto has been the talk of the town ever since it opened its doors in June 2016. This sushi dining spot was awarded 2 stars in the Michelin Guide 2017 shortly half year after the opening. Since then, it has joined the ranks among Tokyo’s most popular restaurants, and of course became one of my favourite places to satisfy my sushi cravings. 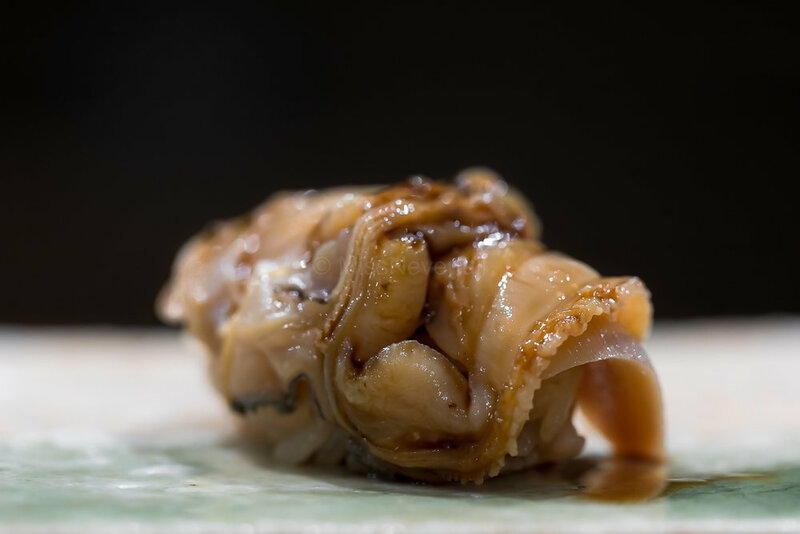 Having spent nine years perfecting his craft at the renowned 2-star Michelin Star sushiya Umi in Aoyamana, Chef Masamichi Amamoto has earned his name as one of the best sushi craftsman in Tokyo. After his time at Umi, he moved on to two of the most revered traditional Japanese restaurants, Shinohara in Shiga (which has now relocated to Ginza) and Gion Sasaki in Kyoto, to further hone his culinary skills, before he finally opened Higashi-Azabu Amamoto, his own sushiya. It is no surprise that with great expectation from gourmands, Higashi-Azabu Amamoto is fully booked all year round. After hundreds of calls in attempt to make a reservation, I finally made mine in October 2016. It took me 7 months before I had the chance to dine at Amamoto-san’s sushiya, but his exquisite and delectable sushi creations were well worth the wait. Otsumami (appetizers) at most sushiyas are prepared by the apprentice back at the hot kitchen, and Amamoto is one of the few that freshly make the dishes by master chef himself at the counter, even includes the grilled fish. I am pretty sure the reason why the otsumami were so amazing is not only because of the conditioned reflex, the dishes were indeed insane, except the seaweed (too sour) and chawanmushi (too salty) which were on the weaker side. This review features my first visit to Amamoto in May.2017. The meal started at 9:50pm with 8 otsumamis followed by 14 pieces of nigiri sushi, and wrapped up with a pieces of tamago (egg omelette) at 00:01am. It is not common to start the nigiri part with Aji, which is higher in oil contents as well as flavors, but Amamoto-san nailed it as a perfect beginning. Some of my friends told me that Amamoto's nigiri is quite big, but i found it is quite fair from the first few pieces. It is definitely not as small as Saito (or Kanesaka style)'s, nor as big as Kimura or any old-school style's. 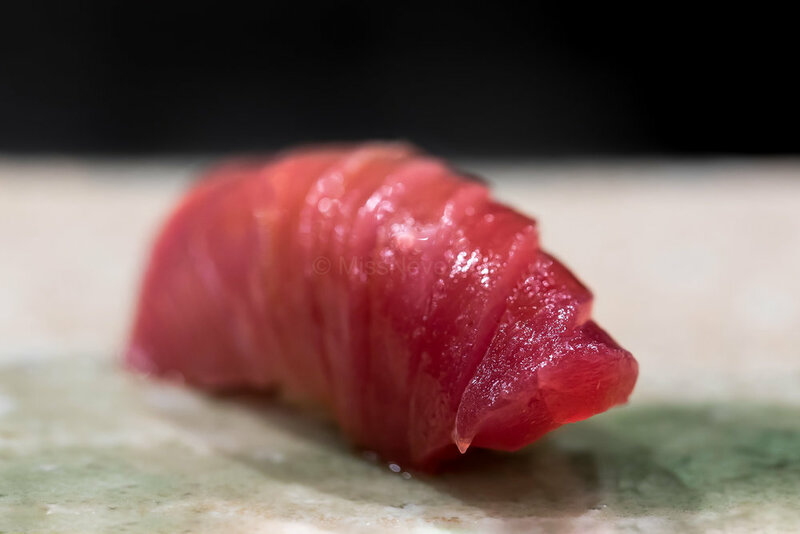 The taste and the temperature of the shari were also right to point, marries the neta (fish) from some of the best origins to make the entire nigiri perfect to my liking. It is hard to say which pieces are my favorite as all of them are outstanding. 8. Kuruma ebi 車海老 - one of the most famous nigiri from Amamoto on Instagram. As big and marvellous as it looks! I had two! Having dined at sushiyas famous for maguro, such as Sushi Arai, Kiyota, Tokami, I found i prefer Amamoto's maguro pieces. From the chutoro i detected a twist of sourness as the chef uses different shari for marugo, it was outstanding. Chiaigishi maguro, or the flesh right by the red muscle, is also worth mentioning as well as the Otoro which was lip-licking good. Tamago 玉子 - one of my favorite tamago. It was already 00:01 when tamago was served. I'm not a late diner nor one gets excited for late dining, but i left Amamoto at 00:20am with such a satisfaction that i never expected. The ambiance at Amamoto was also worth mentioning. Amamoto-san prepares almost everything by himself, with his wife serving dishes and wines. The flow was very smooth and gives me a very relax feeling that i can take time to enjoy the food and chatting with my friends & chef. I cannot wait to go back again as soon as possible.